When it comes to websites, two of the most important things are its look and usability. Now days it is a must for a website to be responsive and user friendly. They should be advanced and thus designed using HTML5 and CSS3, which makes them more accessible. A great and easy way of achieving both these things is by using nice templates. A plethora of really beautiful, decent and responsive templates is available out there, but finding the best ones is not an easy task. We have a collection of 30 Awesome HTML5 & CSS3 Templates. All these templates were especially handpicked and are really beautiful. So check the collection out and pick the one that suits your needs the best. Serenity is a single column template that boasts an image slider on the home page. OWMX-1 is a nice looking neat two column design which is suitable for a blog. SilverBlog is a beautiful blog template which has been also ported to WordPress. Design Company Website is a business style website that boasts its own gallery page. Memoir is a Japanese inspired template which is really suitable for a personal blog. As the name suggests, Cooking Site is a great recipe template. It also has a featured post slider. 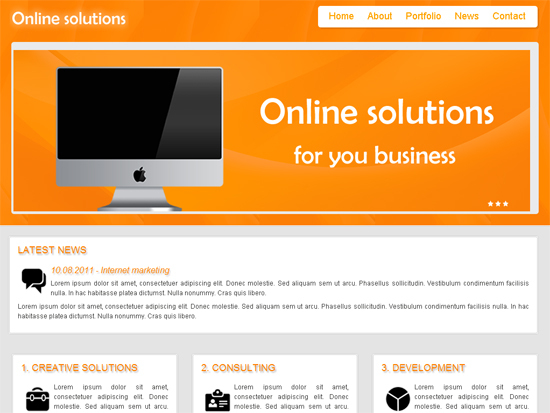 OnlineSolutions is a really cool three column template that is perfect for a corporate website. A minimalistic HTML template that has one column, two column and three column variations. FreshIdeas is a decent black and yellow 2 column template. ArchiteXture is a great 2 column template which would be perfect for a small business website. TryMee is a really cool responsive corporate template that adapts to almost every modern device. Scoove is a nice responsive HTML CSS website template with neat design. tinker is an amazing simple corporate HTML5 Template which could be used for all kinds of businesses. This one is a responsive html5 template which can be used for personal portfolios or creative agencies. GearBox is an easy to use, sophisticated, highly customizable and responsive template. Developr is an awesome HTML5 /CSS3 template with fluid responsive layout and elements and is great for mobile devices. Creative Portfolio is a fabulous contemporary template for creative professionals! This one is a neat, minimal and sophisicated professional premium HTML + CSS template. It is perfect for any kind of corporate website. A clean and sophisticated business HTML template with an elegant design. It comes in 10 colour variations and is perfect for a personal portfolio or a business site. Jupither is a minimalist touch enabled responsive gallery and blog template. It is well suited for photography portfolios. Pertho Admin is a responsive (fixed/fluid) template which is mobile friendly and has a lot of jQuery plugins. A colorful responsive template with full drag and drop gallery and many other amazing features. This one is a HTML portfolio template based on full-screen slider and sliding pages. It is well suited for personal or corporate use. EMPIRE is a really elegant and voguish template which can be used for corporate websites or personal portfolios etc. Zwin is a unique and professional online vcard. It can be a great portfolio with sliding effect, resume and contact information with Google map. This one is a decent, neat and sophisticated template for creative portfolios, agency or companies. A neat and advanced template which is simple yet effective. It boasts 10 different portfolio layouts. Grider is an awesome responsive website template which comess in 7 colors and boasts 3 sliders. An HTML + CSS template which is decent and clean. It is well suited for any kind of corporate, business and portfolio websites. Themis is an amazing minimal corporate template. It is really decent and elegant, being perfect for law, business and investment etc related websites. professional designs and also inspiring to get more techniques toward html5 and css3 development.